Spending his summers in the family cottage in Amery, Wis., north of Eau Claire, Dan York fell in love with the waters of Pike Lake and the surrounding woods he traversed each day. The cottage was idyllic, York remembers. It didn’t have running water or a bathroom. Nor did it have a canoe or kayak, so York spent his time on the water in a rowboat, fishing and exploring the lake. When it was time to go to college, York decided to attend Northland College in Ashland, two hours north of his cottage along the southern shore of Lake Superior. There, he learned how to kayak and became hooked. Because commercially available kayaks were rare, he built his own whitewater kayak, made from of fiberglass using a mold. 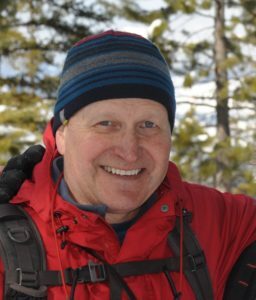 His studies eventually brought him to the University of Wisconsin-Madison in the mid-1980s to early ‘90s, where he earned his master’s degree and then his doctorate in land resource management through the Nelson Institute. York, 58, now works for a national nonprofit based in Washington, D.C., working remotely from his home on energy policy and the economy.“I was really drawn into my career because of my interest in the environment and environmental protection, and I saw energy as one of the key problems to be solved,” York said. While at UW-Madison, in an effort to keep paddling, he joined the Hoofer Outing Club, an organization that organizes outdoor recreation trips for students and community members. After some time away from the club while raising his children, York return to the club that helped make his time at UW-Madison so memorable. Now, he has become a kind of water sports grandmaster in the club, taking on the role of water safety chair. He teaches fledgling paddlers, leads multi-day whitewater trips, and makes sure other trip club leaders follow proper safety protocols. The trips he leads bring him to some incredible landscapes, down winding rivers and through raging rapids. 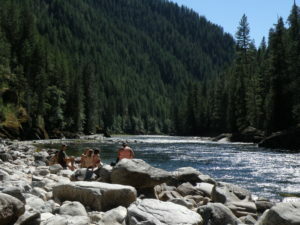 The Selway runs through forest and mountains in a wilderness area spanning over a million acres, second in size to only those in Alaska. But it’s not just the gorgeous scenery that keeps York volunteering with the Hoofers. The companionship that develops on a trip, he says, is unique, and cannot be found in any other group. Sometimes, the friendships forged on Hoofers trips are strong enough to last a lifetime. “It was pretty amazing to see how people wanted to get back together with those old friends in Wisconsin.